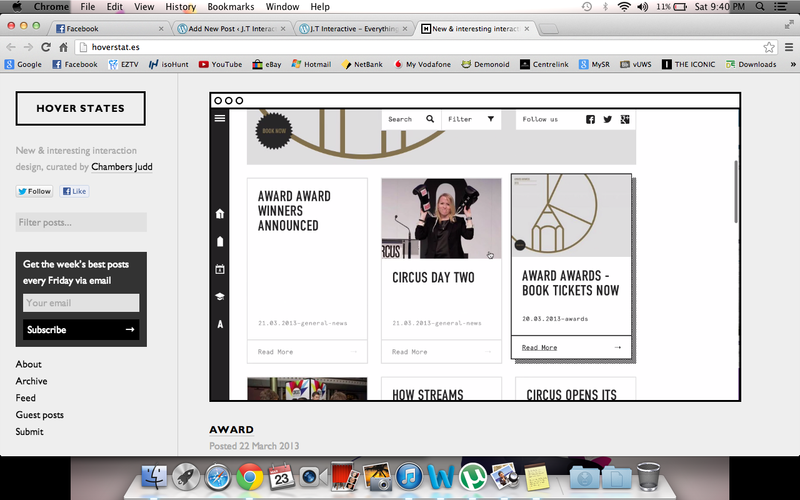 Sparing use of CSS animation and really well considered rollovers make for a snappy feeling UI on the Award site. Our experience with interactive design starts early. Educators know that people absorb information better when they are actively engaged in the process. 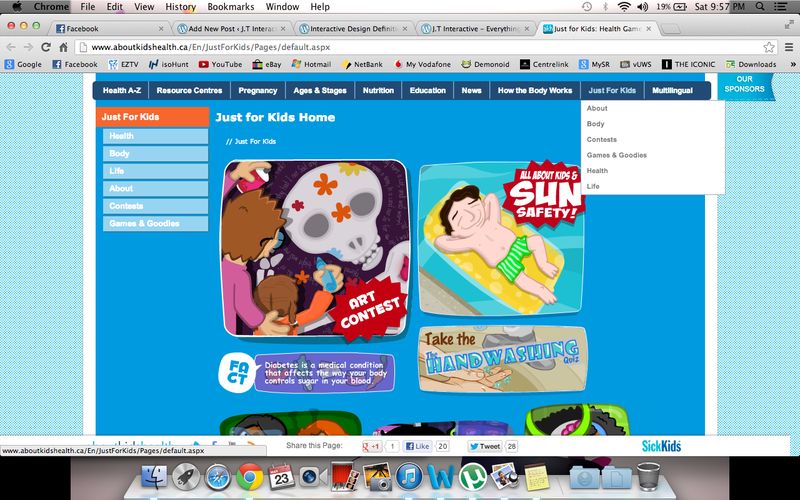 Kids Health run by The Hospital Sick Children in Toronto has managed to make health issues, entertaining through the use of interactive ebooks, multimedia videos, quizzes and heaps and heaps of games on their site. 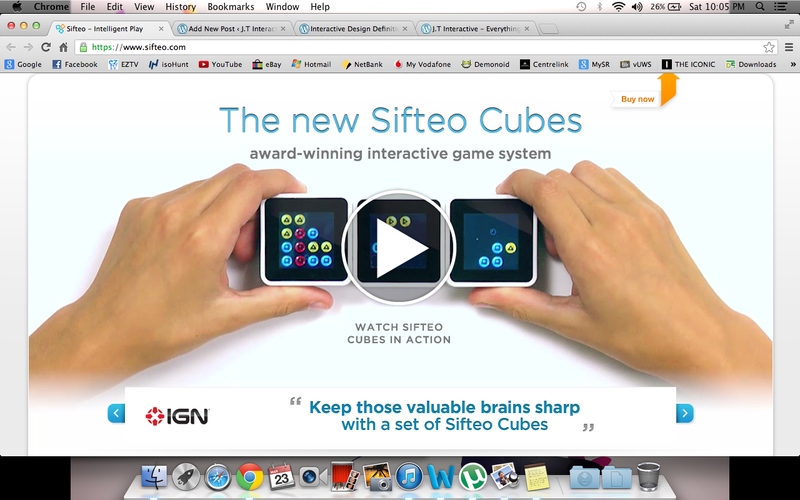 Sifteo cubes are like Lego bricks for the 21st century. The cubes communicate wirelessly to respond to each other and your gestures. The 19 games blend physical and digital interaction. The brainteasers engage kids more than mere button pushing or screen tapping. This is one great example of Interaction Design. A point of interaction. Not interaction itself. The interactive experience depends on an interface but is a whole ecology in itself. Interface is within interaction. Medium across which data passes. Interactivity has been one of the key value added characteristics of new media where old media offered passive consumption, new media offered interactivity. For example, like watching television. You sit there and consume. One producer to many viewers, one to many. Interactivity and new media being more aligned with many users collaborating with each other, or many to many as opposed to one to many. Web 2.0, social media and sharing have brought the idea of new media forward. Generally the term stands for a more powerful sense of user engagement with media text, a more independent relation to sources of knowledge. The user must use the computer and software to make reading choices in the database (Can be anything from the entire world wide web to a particular learning package, an adventure game or the hard drive on your pc.) The end result of such interactions will be that the user constructs for him or herself an individualised text made up from all the segments of text which they call up through their navigation process. Examples: Updating Facebook, leaving comments on blogs, re-tweets, video responses and wikis, etc. 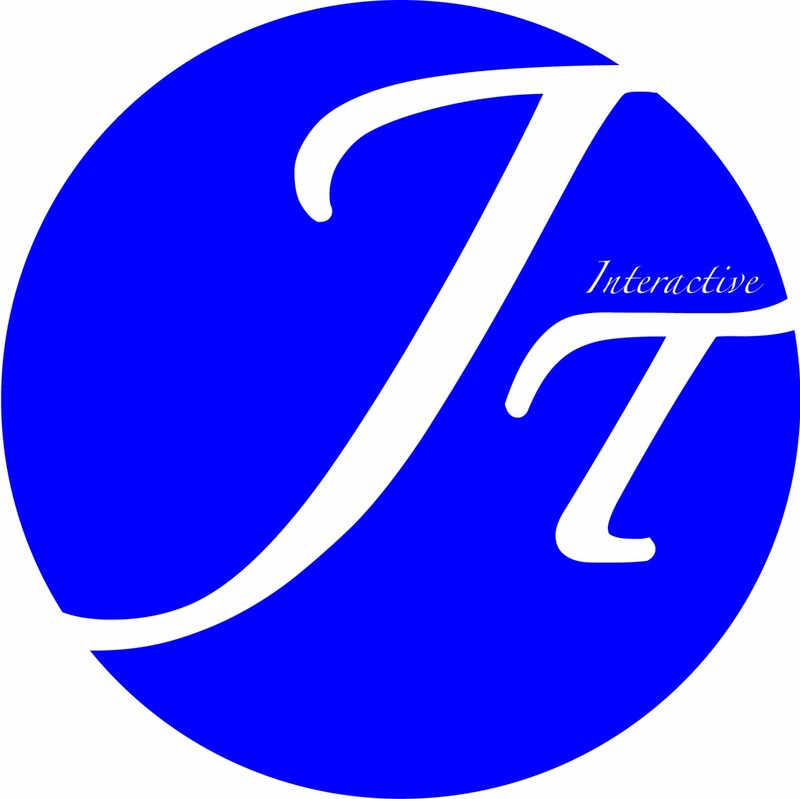 This interactivity depends on other users in a collaboration and a system to freely allow collaboration via the user being able to write back into the interactive experience. A concern with Registrational interactivity is that the user forgoes control of information once it is entered into a system. Based on face to face human communication so we draw parallels or compare and contrasts from that standard or person to person connection. For example: A forum post would be considered less interactive than a live chat site. It’s the continuation of face to face storytelling, basically in a digital context. Use improved figure-ground contrast to signal which elements users should focus on. Use animation and rollovers in navigation toolbars to indicate functional or clickable items. Give contextual and visual cues greater visual distinction. Develop style sheets that specify similar formats for level headings and spacing between text chunks. Highlight potential pathways to readers by using breadcrumb trails, site maps, indices and headers. Develop navigation toolbars that suggest information pathways to users, which don’t just outline content. 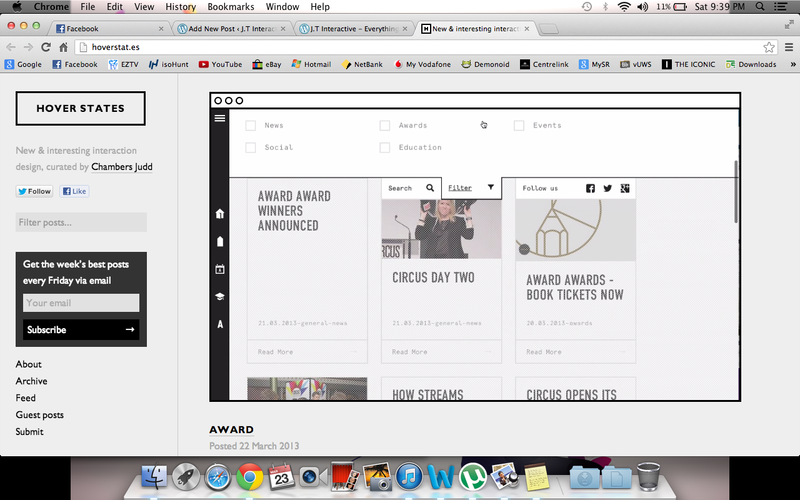 Provide multiple navigation tools and choices for readers such as toolbars, search fields, drop-down lists, site maps etc. Consider time in your design. Don’t make things take too long and provide alternative options like ‘skip’ buttons to allow the user to move past animations and solve their problems quicker if they want to. Place more contextual information, such as visuals cues, in higher site levels. Provide detailed content in lower site levels. Use shaded regions, tables, frames or other methods to anchor navigation tools in consistent locations. Place content no more than 5 to 7 links or clicks from users, so content is not placed too far from users. Use familiar icons, shapes and graphics that rely on prior user knowledge. Place graphics in familiar contexts. Provide text tags for images used in new contexts. Use design metaphors to help users comprehend the arrangement and content of visual spaces. Group related content using visual shapes, such as shaped boxes or rules, or by using space. Use figure-ground contrast and grouping to help users identify relationships between elements. Linear Approach: Pages are only available in a straight line. For example, you can’t get to the last page from the first. The user is forced to go through the middle page to get to the end and back around to the start again. Essentially the user becomes trapped, and it is at this point in traditional web browser scenarios that the user goes for the browsers back button, or leaves the site frustrated and never to return. 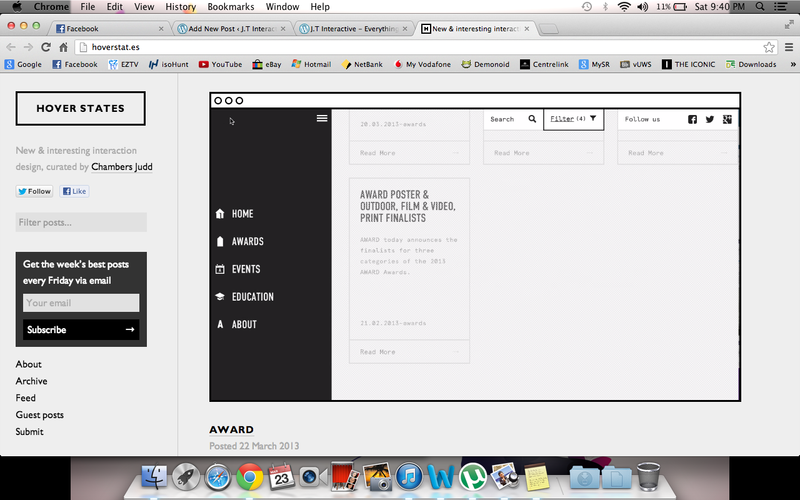 Nonlinear Approach: Allows all pages to be accessible from every page.